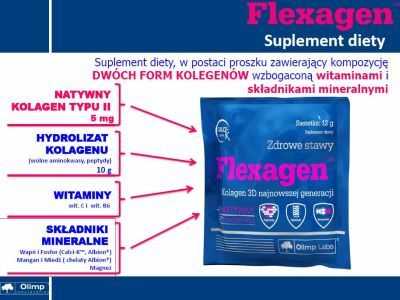 Joint HealthOlimp Flexagen - 1 sasz. Flexagen ™ is an innovative composition of two forms of collagen: native type II collagen hydrolyzate, enriched with a complex of minerals: calcium and phosphorus (Calci-K ™, Albion®), manganese and copper in the form of amino acid chelates ALBION magnesium, and vitamins C, B6. Collagen is a specific group of proteins (so called., Collagen), which represents about 25% of the total protein in the body. So far described, about 20 different types of collagen found in the human body. Regardless of the type, all collagens contain larger or smaller fragments of the triple helix formed by the twisted α chain of repeating the sequence of amino acid residues (glycine, proline and hydroxyproline). Such a structure is characteristic for all the proteins collagen. Collagen proteins are included in the various tissue structures (eg. Skin, cartilage, bone tissue, ligament, blood vessel endothelium), stabilizing them and influencing certain properties. In the human body there is a balance between the natural processes of synthesis and enzymatic degradation of collagen. Zdecydowanie lepiej działał na mnie Flexit z Nutrendu..